In the search for healthy, nutritious food, I have been experimenting with different grains, vegetables and fruits for salads. I specially enjoy Lebanese and Mediterranean cuisine, where the combinations of fresh vegetables, salad greens and herbs gives ideas for very delicious simple meals. 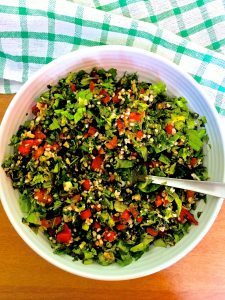 Like this Levantine Tabbouleh made of fresh parsley, some mint, juicy tomatoes, a little Bulgar and really good quality olive oil. Fresh ground black pepper and a smattering of salt, complete this plateful of goodness.